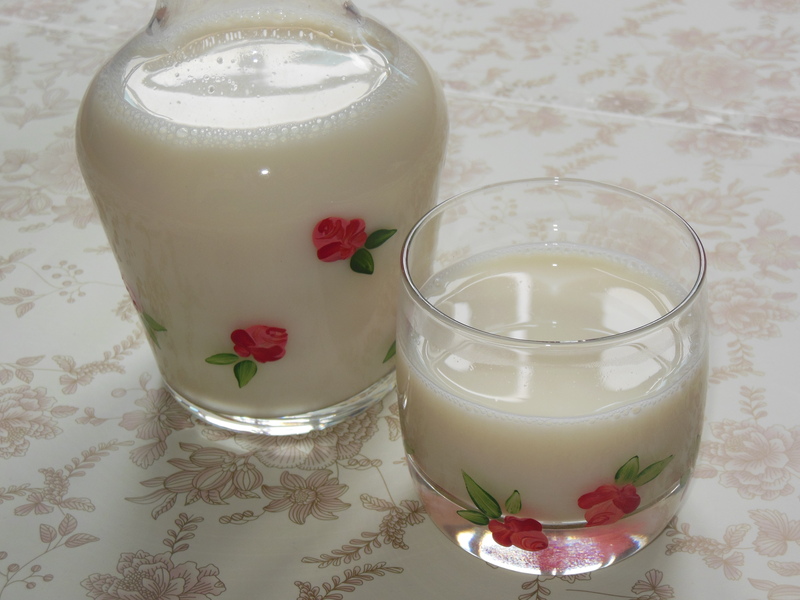 Soy milk…love it or hate it, it’s part of the diet for many Chinese all over the world. When I was growing up, my mum regularly made fresh soy milk as it was better quality and so much cheaper to produce at home. There’s also no fear of added preservatives (which commercially produced soy milk will always contain) to increase shelf-life. Anyway, if you’ve never had it fresh, here’s my recipe to make fresh creamy soy milk, guaranteed to taste better than anything in a carton. It’s free from preservatives, additives, artificial sweeteners, colour and thickening agents. And low in fat as well as cholesterol. There’s only two pieces of equipment you need: a blender and a muslin/cheese cloth which you can turn into a bag with just needle and thread. Equipment: Large bowl, colander, blender, muslin or cheesecloth bag, large deep pan, wooden spoon, ladle, and elbow grease! 1. Soak the soybeans overnight! 2. 24 hours later, drain the water from the soaked soybeans into a colander and rinse with cold tap water. Fill a deep pan with 4 litres of cold water. 3. Divide the soybeans into four batches. Place first batch into the blender and fill with some water from the pan. Don’t overfill to avoid overflow! Blend into a pulp. 4. Place the the muslin/cheese cloth bag into the pan and pour the pulp into it. Twist and secure it into a bag with one hand, and with the other hand squeeze the pulp in the bag while it is submerged in the pan of water. Do this 5-6 times and you will notice that the water will start to turn milky. The longer you squeeze, the more milky and creamier the water will become. Use a ladle to remove the foam that forms on the surface. 5. Give the bag a final squeeze when it out of the pan and then empty the pulp into a bowl. Now add the second batch of soybean and some milky liquid from the pan into the blender. Turn into pulp then repeat step 4 above. Continue until all the soybeans have been used up. 6. Heat the pan full of soy milk on medium heat and occasionally stir the pan with a wooden spoon. DO NOT WALK AWAY. From personal experience, the pan will always boil over rapidly when you least expect it! Skim off any foam from the surface and allow the soy milk to come to boiling point, then remove from the heat to prevent overflow and then turn the heat down to low. Allow the soy milk to cook for a further 5-10 minutes. See attached short video for example of what I mean! 7. Remove from heat and add sugar if you want to sweeten. If not, allow to cool completely before transferring to the fridge. The soy milk will keep well for up to five days if stored this way. Note that as the soy milk cools, a skin-like film will form on top, just remove before drinking. Finally, what to do with the remaining pulp? The northern Chinese like to mix it with flour and egg and turn it into pancakes but southern Chinese don’t have this tradition. We just add it to our plants as it makes good fertiliser. Your northern Chinese friends may not appreciate this, but your rosebeds will! Previous Previous post: Pimp My Cupcakes! Next Next post: Vietnamese Dressing, Dipping Sauce …or Nước chấm!